Shoot great images and videos on land and at sea with the Vivitar VS048 Compact Camera. With a 16 megapixel CMOS sensor, you’ll be able to capture more light in your photos, for great visuals in a range of settings. Remember your favourite moments and capture 720p high definition video. Showcasing a built in flash for darker moments and a rear LCD screen that lets you look back through your photos, the VS048 is designed for versatile photo and film capture. Powered by AAA batteries, you can quickly and easily replace the old batteries when they run out of charge so that you are never caught out on a day trip. 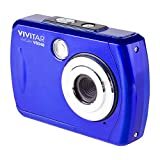 With a digital zoom and durable design, the Vivitar VS048 Compact Camera is a great addition to days out and holidays. This entry was posted in Discount Photography and tagged Blue, Camera, Digital, MegaPixel, Underwater, Vivitar, VS048, Waterproof by Ball Photo. Bookmark the permalink.